I'm all about flowers... I love them. Hint Hint Honey.... What's great about this set called Bold Bouquet from Clear Dollar Stamps available May 1st is that it has so many different flowers, and different ways to layer the flowers to make something fantastic. 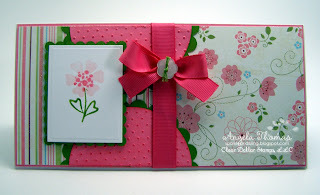 Each month, the CDS design team gets challenges.... And boy did this one challenge me but I LOVE how it turned out. This card is a sketch (which I've flipped on its side) and also for having a flower and a bow together. I've been hoarding this DP for so long and I am glad I did because it just enhanced the beauty of the flower. My second card using this set is for one of the color challenges to use blue (any shades) and white on a card. Believe it or not, I had this card all together, pictures taken and edited before I ripped it apart to add the brad which is what I think makes this card elegant. I've stamped and embossed two different flowers from this set before cutting them out and popping each one up using stamping dimensionals. For the center of the flower, I used a button in the same tones of blue. Check out what the CDS girls have been up to using this set. Very beautiful and elegant designs! Hi Angela! These samples are A-MA-ZING! Really! I love them both! Great job with the Sketch Challenge...love that horded designer paper, too! LOL And the blue one with the houndstooth background dp, is gorgeous! Great brads, too! The Sneak Peeks have begun!